It’ll be nice to have two statues outside of the Coliseum to welcome soon to be vanquished foes. Friends and family of West Virginia University men’s basketball great Rod “Hot Rod” Hundley have started a special fundraising campaign for a statue of “The Clown Prince” to be placed at the WVU Coliseum. The fundraising efforts for the statue are being planned and commissioned by Hundley’s family and friends with a goal to reach $300,000 in order to complete the entire design and installation process. The Hundley statue will be designed and sculpted by nationally known Morgantown artist Jamie Lester, and will feature Hundley in one of his signature moves – the hook shot. All contributions to the fund are tax deductible and payable to the WVU Foundation, One Waterfront Place, 7th Floor, PO Box 1650, Morgantown, WV 26507-1650. 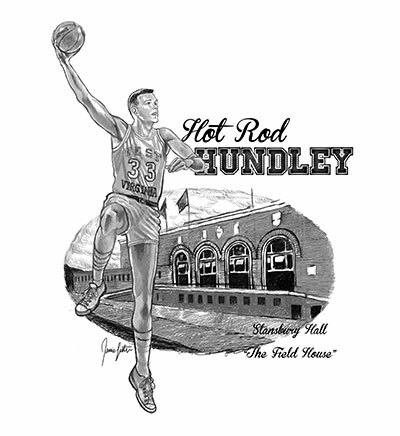 In the memo line, donors are asked to write in “Hot Rod Hundley Statue Fund,” and any donations raised over the goal amount will go toward the Rod Hundley basketball scholarship fund that already has been established with the WVU Foundation.